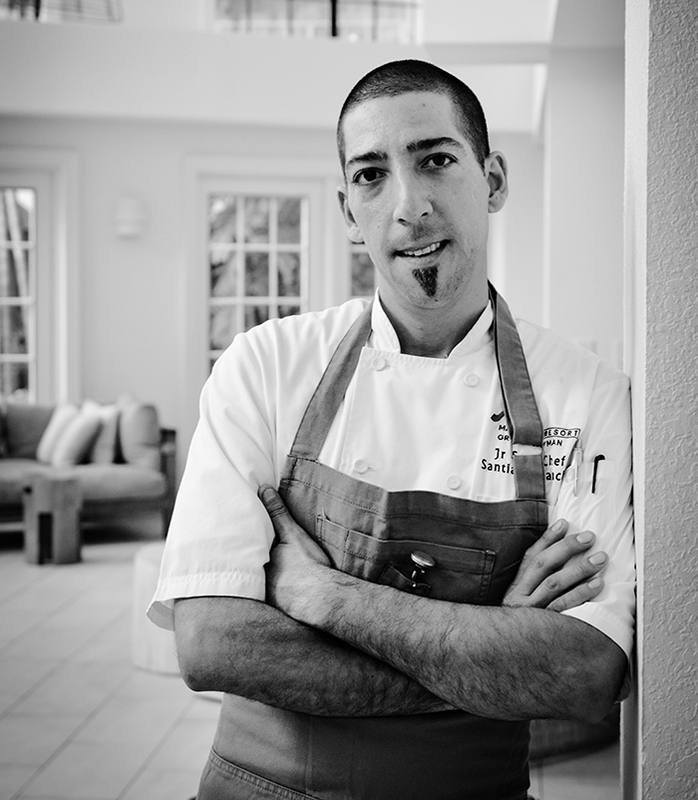 A&D: Santiago, you are a well-established Chef here in Cayman and we want to know when did you decide to become a Chef? Where did your journey begin on your road to success and did you have an influencer in your life who inspired you to make this decision? SM: I couldn’t find myself in college – I was always up and down on what I wanted to do. It actually took me years to figure out what career path I wanted to take. I loved cooking at home and always did so when I thought to myself: “Wait, I could do this to make a living – I will give it a go!” I was 21 when I stepped into my first professional kitchen but when I did I knew this is what I wanted to do; I just felt it. My mother was working two jobs when I was growing up, so cooking at home was a necessity for my brothers and me, but I loved it and I enjoyed cooking for my family. I was very young when my grandparents passed but I still remember memories of them – they both loved to cook. The memories of the smells and tastes from when I was growing up definitely influence my cooking. Obviously I admire some big influencers in the culinary world. There are many successful Chefs I look up to but Marco Pierre White is my guy. He started this new style of cuisine and techniques for Chefs and he had a vision of what this industry could be but 35 years ago. He’s so ahead of his time. I think he’s incredible. I didn’t think straight away when I started in this career: “Right I’m going to be the biggest and best Chef in the world.” I just loved to cook and I knew I needed to start somewhere. I began studying for three years back home at Union De Chefs Argentinos. It wasn’t a fancy school I didn’t have much of a budget back then. I was working part time in a meat processing factory to make money for school – that was tough! I think that this was one of the biggest learning curves I have experienced while learning to be a Chef. Tolerating the long unsociable hours helped me adapt to Chef life a little easier and seeing meat being prepared and packaged teaches you a lot. Learning that process teaches you to respect your produce and where it comes from, which I think makes a person a good Chef. I was given a fantastic opportunity a few years later to be a part of a culinary training program at the Ritz Carlton in Naples, Florida. This for me was a game changer, I learnt a lot of techniques, different cuisines, how a 5* hotel operates, how to be disciplined as a cook and as a leader. This training and exposure was seriously life changing for me; I left Argentina a cook and came back a Head Chef. When I came home after 2 years in Naples, I was offered to be a Head Chef for a chain of steak restaurants. This was a huge deal for me in my country and I thought to myself: “Wow I’ve made it!” But I never knew what opportunities were just around the corner. A&D: With this amazing job in Argentina what brought you to Grand Cayman? SM: I moved to Cayman in 2010 because I felt the need for something more that I didn’t think I could achieve at home, I started looking around for other opportunities and Grand Cayman popped up. I began working for a few independent Italian restaurants. I am familiar with this style of cooking – I had a very old school background when it comes to techniques back then, my palate was very structured so when I moved here and I started working for Cindy Hutson in her restaurant Ortanique my knowledge expanded, massively! The Head chef there, Sar Mair taught me everything about Caribbean food, spice, tropical infusions this was all new to me. This expereince really drove my passion for other cuisines, I was very privileged to explore this new world of flavour. A&D: So eventually your journey brought you over to us at Anchor & Den, what do you love about your job here and the A&D community? SM: What I love about working here is the diversity, not just in the kitchen but the whole team – Front and Back of House. We don’t get stuck in one style of cuisine, the assortment of recipes and ideas that are thrown together makes the Anchor & Den menu so unique and special. It’s comfort food from all over the world. I give my staff the freedom to experiment, I think this is what makes a good working environment in a kitchen. We are all here for a reason and we all want to be creators so I let them! A&D: That’s great and also very rare in a kitchen that your staff have that opportunity to do this, you really take our philosophy ‘Sourced locally inspired globally” seriously. It’s amazing! When it comes to your style of cooking as a Chef what inspires your recipes? SM: I like to recreate flavours and tastes that bring me back to a Sunday dinner back home. Yes, I have been trained and worked in fine dining – it’s great and I love fancy food but it’s not my style. I love basic and rustic style cooking and I like being free when I cook! My favourite staple ingredients are garlic, thyme and parsley, salt and pepper – this is all you need to enhance your favourites. Basic but delicious! A&D: One last question, what advice would you give a young aspiring cook that is just starting in their career? SM: Don’t miss steps, learn everything you can and learn from your mistakes. Work on the basics before anything else because one day it will all come in handy. Work hard because it’s worth it in the end and it will all pay off eventually. It doesn’t seem it sometimes (laughter) but really, it’s worth it. It took me 15 years but I feel like I’ve got to where I want to be.